Many of our listeners are familiar with intravascular stents, a commonly used tool to help treat coronary artery disease. The stents used today are metallic, and some of the stents are coated to reduce the post-implant complications of this “foreign” device being inserted in the body. In today’s podcast, Dr. Robert Eberhart discusses the research that he and his colleagues are pursuing to bring to clinical practice a radically different design of an intravascular stent. 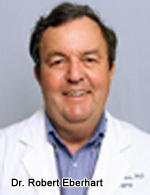 Dr. Eberhart is a Professor, Department of Engineering in Surgery, University of Texas Southwestern. The device that has been developed in the Eberhart Labs is a bioresorbable poly-(L-lactic Acid) stent that is porous enough so that drugs can be implanted in the stent and slowly released over an extended period of time. For more information about Dr. Eberhart’s work please click here.